Waterproof Ammunition | Ammo & Bullet Mfg. Inc. Together with firearms, ammunition is a powerful tool for helping law enforcers, armed forces, and even private gun owners protect and save lives. However, one threat to ammo’s quality is moisture, which can be caused by weather and temperature changes, natural disasters like flooding, and improper storage. No matter how water-resistant ammo can be, moisture can render it defective, and therefore, dangerous. Wet Ammo Can Still Be Used, Right? There has been a lot of talk about using wet ammunition. Some people might tell you that ammunition is mostly “waterproof”, so it’s all right to wipe it dry and reuse it. They may even suggest other ways of “reusing” wet ammo. It’s better to be safe than sorry, though. Since its cases are made of metal, ammo is prone to corrosion, or rust, when exposed to moisture. A little rust on your ammo can still be wiped off. However, if it is left unattended for a long time in a humid area or storage box, moisture can creep onto your ammo and cause it to rust. Like what you’d do with ammo with other defects, you can never trust rusty ammo. Wet Ammo May Cause Hang Fires and Misfires. Firing wet ammo can also result in hang fires and misfires. A hang fire (a.k.a. “light hit”, or “click without a bang”) happens when the hammer or firing pin adequately strikes the primer, but the primer fails to ignite the gunpowder; hence, the firing is delayed. A misfire occurs when the hammer or firing pin fails to strike the primer, and therefore, the cartridge fails to fire. Both hang fire and misfire pose a serious threat to you, especially when you try to dislodge the cartridge or still fire the gun after such incidents. Water in your gun’s chamber can drastically affect your ammo. Water is highly resistant to compression, so once it gets into your gun’s chamber and onto the cartridge, water takes up space that should be occupied by the pressure from the ignited powder. 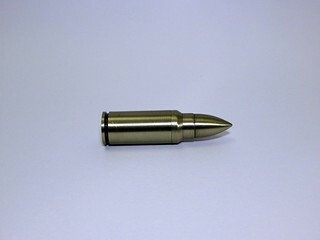 When you fire this cartridge, there is more pressure exerted than necessary in the chamber, and this may cause the cartridge’s case to crack and pop. Hot gas and even bits of brass can also escape from your firearm and injure you in the process. Wet Ammo May Cause Obstruction. The Sporting Arms and Ammunition Manufacturers’ Institute, Inc. (SAAMI) cautions gun owners on the obstruction that wet ammo usage can cause. An obstruction takes place when you fire and the cartridge is stuck in the barrel due to insufficient pressure. This lack of pressure is caused by initiation of the primer and ignition of only a portion of the powder. When you fire a cartridge from an obstructed barrel, it may cause you critical physical injury or even death. How Do We Go About Waterproofing Ammo, Then? Store Ammo in Proper Storage Boxes. You may use the original box that your ammo came with when you first bought them, but military-style storage boxes or cans with rubber gaskets lining their lids are recommended for storing ammo for the long term. The rubber gasket helps keep humid air, water, and other contaminants off your ammo. The newer the box or can, the better, as the rubber gaskets for used boxes and cans might have already been worn out. Add Silica Gel Packets or Desiccants Into Your Ammo Box. Don’t throw away those little silica gel packets from your shoe boxes just yet. You can add these packets into your ammo box. The tiny beads in these packets absorb moisture from within the box, which means double protection for your ammo. Running out of these packets? You can use a rechargeable desiccant instead. You can also use vacuum seal bags for waterproofing your ammo. Most of these bags are see-through, so you can easily spot your ammo when you have to fetch them from deep within your box or can. Vacuum seal bags are also airtight, so they protect your ammo from even the tiniest fleck of dust. Store Ammo in Places Above Sea Level. In case you store your ammo in your basement, it might be among the first to get hit when a flood occurs. Place your ammo in cabinets or racks and as high as possible. Keep Ammo Taken Into the Field Away From Unused Ones. If your ammo is in any way exposed to moisture, and you weren’t able to use it, refrain from placing it back into the box from which you have taken it. The moisture that may have clung onto these cartridges might get onto others in the box. You can’t risk exposing the rest of your stored ammo to moisture. Place them in a separate box or can. Keeping Ammo Safe Is Keeping Lives Safe. We can never compromise safety—ours and that of the people we protect. In the same manner, we can never compromise the quality of the tools that help us ensure it. That is why our team at Ammo & Bullet never settles for just “reliable” in developing and manufacturing top-notch ammunition. We provide custom ammunition with meticulous, unyielding quality. Get in touch with us now for ammunition with excellence that precisely hits the target.